Fugitive Italian anti-war activist Turi Vaccaro has been arrested and imprisoned in Gela, Sicily, where he will serve an 11-month, 27-day sentence. 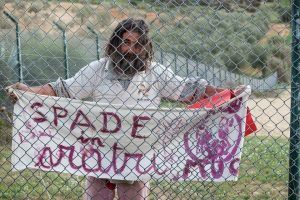 Acting on a warrant issued in November, 2017, DIGOS, the Italian special police, determined that the well-known practitioner of nonviolent direct action would attend this summer’s annual NO MUOS protest camp near Niscemi. MUOS is the acronym of a Pentagon satellite relay station critical to U.S. war making in the Middle East and Africa. The massive dish antennas and transmission towers are planted on land cleared from a beloved cork-oak forest preserve, and their ultra high frequency radiation bathes neighboring residents. Police observed Vaccaro among hundreds of others on the big August 4 march, where some demonstrators tried to bring down a section of chain-link and barbed wire fence only to be rebuffed by police firing tear gas. The next day, as protesters relaxed and broke their camp, police decided to execute the warrant for Vaccaro’s arrest and imprisonment on a criminal damage conviction from 2015. When Vaccaro again approached the fence, DIGOS agents shouted at him to stop. Police gave chase on foot as the notoriously barefoot activist scampered away down the rural lane. About fifty activists quickly mobilized a cordon to slow the police pursuit, and Vaccaro disappeared into the countryside. Hours later, police reported his arrest as he hid in thick vegetation less than a mile away. Vaccaro entered a building at the base of one antenna, and used a large boulder to damage electrical equipment inside. U.S. military police arrested him, and he was convicted in 2015. 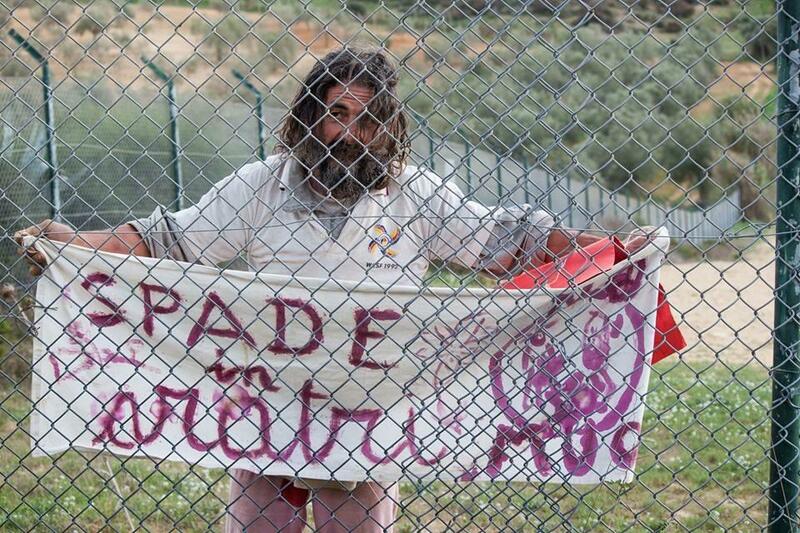 In a show of solidarity, supporters rallied outside the fence of the Gela prison on August 9. Vaccaro was also arrested at MUOS in November, 2015 after spending 34 hours perched atop one of the giant parabolic antennas. While there, he hammered on the delicate reflecting panels, causing an estimated $800,000 of damage. In 2005, Vaccaro served six months in prison in the Netherlands for entering an airbase and hammering on two F-16 nuclear bombers. For more information, visit nomuos.info.